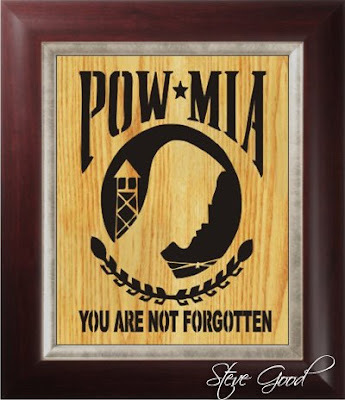 I had a request from a reader to create a pattern from the POW MIA emblem. This graphic has a lot of meaning to many Americans. It's important that we never forget the sacrifice of our young men and women in the armed forces. They are true hero's. Forget politics and remember that these are our sons and daughters that we send to protect our freedoms. Sometimes they pay the ultimate price. They deserve our utmost respect. This is another video review of great scroll saw web sites. www.finescrollsaw.com is a web site in Spain put together by a gentleman named Pedro. If you are a fan of fine fretwork patterns then this site is a gold mine. Take a look at this video review then jump over to Pedro's site and spend some time looking around. You won't be sorry but you might looses a few hours of your time.